2 Hours of Unlimited Bowling (2 lanes- approx. 10 bowlers), Shoe Rental, One Sheet Pizza, 2 Pitchers of Soda, & Paper Products. Each additional lane – $75 including one large pizza and one pitcher of soda. Must be used during same time slot as party. *Contact Party Planner for more information. Fill out a party request below and our party planner will give you a call! 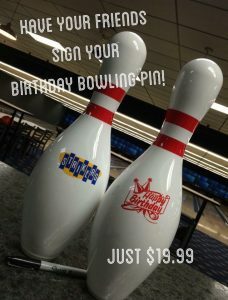 We can customize any Bowling or Bar Party to fit your needs. Add any menu or banquet item to your party. Options include: Extra Pizza, Wings, Appetizer Platters, Sub Platters, French Fries, Chips, and many more. Click below to review our Restaurant and Banquet Menu. Please ask party planner for details. Bring your own cake or cupcakes. No other outside food or drink allowed including chips and juice boxes. We do not have a separate room. Your party will take place on the lanes and tables behind those lanes in the two hour time frame. Additional time can be added to a bowling party depending on availability. Please ask the party planner about pricing.